It was definitely a coup to get Cynthia Dale for our first "celebrity" cover in Live It! magazine. Interviewing and writing about this warm, thoughtful and insightful woman was truly a delight for me. I guess I've always been a Royalty watcher. When I was very young, my grandmother used to subscribe to a British publication called Women's Weekly and it always had articles about the Royal Family, which I enthusiastically devoured. When Prince Charles married Diana Spencer, I was one of the "billion people around the world" glued to the television screen. Likewise 17 years later when Diana's funeral cortege moved through the streets of London to Westminster Abbey. I'd have loved to be a journalist covering the princess, to have interviewed her, known her. But, failing that, doing this cover story for Forever Young, was the next best thing. It is one that I am extremely proud of. When I heard that a London veteran was credited with taking out Rommel -- the Desert Fox -- during WW II, I knew it would be a great story for Forever Young. But when I spent an afternoon with Charley, first listening to him recount his wartime experiences for a group of senior Kiwanians in London and, later, listening to him talk about his passion for ensuring that young people today, born decades after that war, understand and appreciate the sacrifices that led to the lifestyle they enjoy, I was truly inspired. And, last November, when I opened the paper and learned of his death in a car crash, I was deeply saddened. I hope these articles convey all those emotions and touch the hearts of readers. This cover story for Live It! magazine wasn't the first time I'd encountered and written about Greta and Janet Podleski, widely known as the "Looneyspoon sisters" after their first cookbook of low-fat recipes set Canadian sales records. But it's always fun to talk to these two lively and highly entertaining women. And I take great pride in the fact that we share the same hometown of St. Thomas, Ontario. Interviewing Veronica Tennant, a true icon of Canadian ballet, was indeed a treat. I found her easy to talk with, down to earth and passionate about her causes, be it her filmmaking career or a healthy lifestyle. Who didn't 'grow up' through the seventies and not love the music of Blood Sweat and Tears! I remember working with the Saskatchewan Teachers' Federation, in the mid-seventies, and doing a lot of driving around that province in my little yellow Mazda with an 8-track (yup!) tape deck. BST was one of my first tape buys and the surely made that long, lonely highway between Saskatoon and Regina go by a whole lot faster. 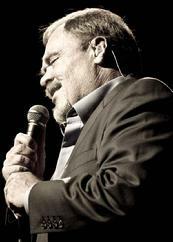 So, the opportunity to talk to David Clayton Thomas was, to say the least, a thrill. A few months later, he played the Blues Fest in London (that's where the picture on the page was taken) and thanks to my friend Anya (Anya Wilson Promotion and Publicity/Toronto) I got a brief-but-exciting back-stage meeting with the man. Totally awesome! And just this month, I had the priveledge of interviewing him again as he prepares to fulfill another lifelong dream, taking the stage at Massey Hall along with the Toronto Symphony Orchestra.